Recently we lay more and more emphasis on security. “Estel” company offers only tested and reliable security systems, which have special burglar-resistant elements. With our burglar-resistant systems, an attractive appearance is retained irrespective of the security provided. This is because with burglar-resistant systems, increased security is mainly going on behind the scenes. Using innovative technology, the user is therefore protected in the long term. The resistance classes according to DIN V ENV 1627 are defined according to type of break-in, the method used, place, risk and recommendations for use from WK 1 to WK 4. WK 1: Building components offer basic protection against attempts to break in using the bodyweight, such as kicking, flying kick, shoulder charge, lifting upwards and tearing out. These building components only offer limited protection against the use of lever tools. WK 2: Opportunist burglars also use simple tools like screwdrivers, pliers and hand axes to try to break into locked and bolted building components. WK 3: Burglars use a second screwdriver and a crow-bar to try to break into locked and bolted building components. 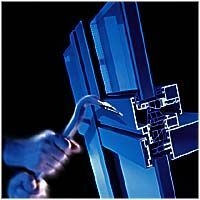 WK 4: Experienced burglars may also use cutting and striking tools, such as pickaxe, crowbar, hammer and chisel, and possibly an electric drill. Despite the high security requirements, architects and their clients still retain the same creative freedom on account of customized shapes and colour schemes.